Hello All! For some reason, the original post of this won’t post correctly, so I’ve redone it. Hope you enjoy! First, I will start off by apologizing for not sticking to my own agenda! It’s been busy at the Zoo and I had to take some family time to get some things done, so posting was neglected!!!! I’m not gonna promise it won’t happen again, because I would probably be lying! 😀 However, I will do my best!!! I took an old frame that I had bought at Dollar Tree a while back and decided to re-purpose it! It no longer fit my decor anyway! I painted it first with a solid color, then again with glitter paint. Here is a closer pic so you can see the glitter paint. Please excuse the dot, this was before I got rid of it!!! 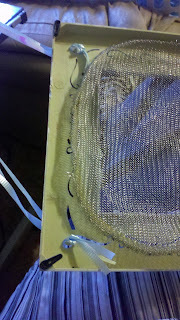 I used my hot glue gun to glue the mesh down after stretching it out. Just remember, it dries fast so you have to move fast! I would glue an area, clamp it, then move to the next area. If you don’t have clamps, you can use some heavy object, just do one spot at a time. Messing up is an easy fix, just peel off the glue and do it again! It won’t mess up the paint, so no worries!!! I used some balloon ribbon to hang it. 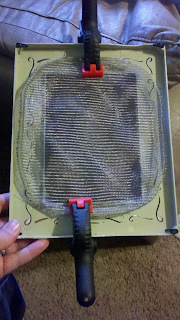 Since the frame had designs cut into it, I simply ran the ribbon through. 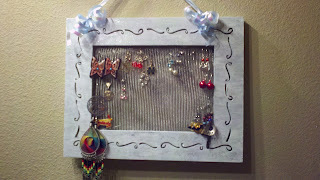 If your frame doesn’t have design cut through it, you could use a pop tab on each side or just glue the ribbon directly to the frame. I liked that since I didn’t glue it directly, I could easily change the way it is hung.